I never read a word by the Marquis de Sade, the subject of yesterday's post, but French writer Sidonie-Gabrielle Colette is one of my favorite authors. I started, just as she did, with the Claudines, and eventually I worked my way through most everything else, and then I followed that up with a few biographies. That was many years ago now, and although I've re-read most of her books since then, some more than once, it's been awhile. Last night I took out My Mother's House and Sido, and skimmed through the sections where she writes about her mother's garden, and I glanced quickly through The Vagabond and Chéri to remind myself why I so loved them. Colette's life, like her writing, was turbulent, passionate, and above all, unconventional. I know there was, at some point, a Claudine perfume — wouldn't it be fun to smell that now? — but I have no idea what perfume Colette wore herself. If I had to assign her a perfume, it would surely be a heady floral — Piguet Fracas is perhaps too obvious, but it fits. If you'll pardon the anachronism, Etat Libre d'Orange Jasmin et Cigarette would also work, although you'd have to amp it up: more (indolic) jasmine, more smoke, and maybe a hint of leather or some other animalic note in the base. Histoires de Parfums has done something entirely different. 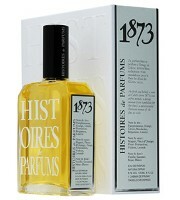 Their 1873 Colette fragrance is a carefree and light gourmand citrus. It starts out sparkling and sweet and tart: seriously, think Sweetart candies floating in a combination of 7Up and Fresca (or don't, if that upsets you). It dries down into a blended floral, heavy on the orange blossom, over a pale, milky-velvety woody musk base (the notes: citrus, orange blossom, lily of the valley, lavender, vanilla, caramel and white musk). It can be a little sharp early on, but later it's softer and rounder, and while it's sweet, it's not so terribly sweet as it probably sounds. The citrus notes seem to linger on well into the later stages, and the lasting power is reasonably good. Histoires de Parfums markets it as a feminine, but I should think anyone could wear it. If you have a problem wearing grapefruit, you'll certainly want to try it several times before you buy, but of course you should always do that anyway, right? 1873 Colette is a sunny, happy, summery scent. It's probably not the best fragrance from Histoires de Parfums, but it's my personal favorite.1 If you're after something that evokes Colette, I don't think you'll find it here — any connection with Colette is lost on me, at any rate — but if you can put that issue aside, it's worth a shot. Histoires de Parfums 1873 Colette is available in 120 ml Eau de Parfum; for buying information see the listing for Histoires de Parfums under Perfume Houses. Note: I should mention that my sample of 1873 is 1 or 2 years old, and so predates the latest packaging change at Histoires de Parfums, and I do not know if it has since been reformulated. Update: it looks like 1873 has been reformulated, but after looking through the materials that came with my sample set, I'm now pretty sure (but not 100% sure) 100% sure that I have the newer version. Another note: image of Colette [cropped] via Le Centre d'études Colette. 1. Not counting their newer releases, which I'm still testing. It is likely that one or another of the tuberose trio will supplant 1873 Colette, and I haven't yet tried Moulin Rouge at all. I’ve been puzzled by the chose notes for this one from the outset. I don’t have the reference on hand, but if memory serves Colette was faithful to her jasmine perfume, by a house whose owner she was friends with, so your jasmine idea is spot-on. She was of course a famous gourmande, one of her favorite snacks being roasted chocolate. If you’re read all of her works I’m sure you enjoyed her short pieces on different flowers: she compares tuberose to “the tip of a young breast” and says gardenia smells like a combination of orange blossom and meadow mushroom. I’ve sometimes wondered what her wonderful French feels like in translation, but if you’ve enjoyed it, then something of her sensuousness must get through. I have all the original translations, which are generally supposed to be good, although it is a shame that there isn’t a unified set — they’re all done by different translators. Some (more than others) sound slightly stilted, but I prefer slightly stilted to modernized — I just detest the new(ish) Proust translations for Penguin UK and would much rather live with the shortcomings of the old Modern Library versions. In that sense, we’re perhaps lucky that Colette is not more popular in the US, or someone would have done a new and more annoying translation by now. I do not at all remember the short pieces on flowers — I was not kidding when I said it had been a long time. What book is that from? In French it’s called “Pour un Herbier”. I have no idea about the English translation, or even if it was translated. She did the pieces while she was recovering from an operation in a Swiss hotel, so they’re probably from the 40s. I will have to look, but the name is not familiar. Thanks! One of my favorites of all time, the Sido stories, and yes, it would be hard to choose among all the fragrance references for Colette to make one that personifies her. That whole era is especially rich in scent references anyway, but I applaud the effort. It sounds like the perfume is worth it. Not heard so much about Colette lately, so if she is being re-discovered or brought back to the fore and this perfume is the tip of the iceberg, I am all for it! Time to re-read her again. My perception, which is perhaps quite off base since I don’t keep up with such things very well, is that Colette saw a resurgence in the US in the 60s/70s but that she is no longer read as widely as she was then. I love Colette very much. I am curious and will check on project Gutemberg or wikisource to see how they managed to keep her song-like sentences in English – if it is there. On the other hand, you can get there the feeling of her French prose. BTW, a recent movie based on Colette’s novel Cheri was released last year, featuring the gorgeous Michelle Pfeiffer. On the perfume, HDP has not excited me with any of their fragrances, but I am soooo looking forward to the Tuberose trio..
Project Gutenberg, unfortunately, has nearly nothing from Colette in English. Hi Robin. I can confirm that 1826, 1873, and 1876 were reformulated with the new packaging. Went through this earlier last year with Katie over at miomia when she had the old scents on sale. I had samples of the “new” ones, and she sent me some samples of the “old” ones. I compared them, and she confirmed that these three scents had changed. Well, then I suppose I should have tried to get a new sample before I reviewed it, how stupid. Hope it is not much changed. Yes, but have to say that that means nothing to me…new lists of notes, even for reformulated fragrances, are often nothing more than a change in the way they want to market something. I would not at all assume from that that HdP “took out” the ivy and “added” something else. Oops! Lots of “notes” mentioned in that last one. Ha. Oh, I’m sure they’re different. Just always wary of taking lists of notes too seriously! yes they were reformulated and Colette was barely recognizable. I had a sample of the “new” version from one etailer , liked it quite a bit and decided to “risk it” when Katie had the older bottles for sale—she warned me it was different , I bought it anyhow. I found the older version to be too sharp and green (floral but GREEN floral) for my nose and after a while it started giving me a headache….eventually I traded it away to a perfumista who was thrilled to have it. So everyone was happy. The new version is softer, more floral. Pretty sure now that what I have is the newer version. OK…if the sample is from HdP, and not from a decanted bottle – the old sample vials are large – 2ml – with clear labels and black lettering. The new sample vials are smaller – 1.5ml – with colored labels and silver lettering. 1873 has a white label with silver lettering. Hope this helps anyone needing sample identification. Yep, my sample is “new” then. I think I might also have an old one somewhere, I’ll have to check. Susan Irvine, in her Perfume Guide, says that Colette wore Jicky. But of course it’s hard to check such things. Interesting article – I’m quite fascinated by the idea of Diaghalev wearing Mitsouko – but so surprising that he says, “you are not buying a reproduction or an approximation. It really is the same perfume” as that worn by Queen Victoria, Collette, etc. !!!!!!!!!! 2 Histoires reviews in 2 days- how fortiuitous for me! I’m very interested in this line but haven’t smelled any yet, so I was looking for some guidance. While I think its true that this scent doesn’t sound Colette-ish in the way I’d expect (funny how it seems like ELd’O scents would fit better for the Histoires chracters of the last 2 reviews), it sounds like something I just might love. The sweet tarts and fresca part sounds more appealing to me than it probably should, and I do love me some sunny, happy, summery scents. I look forward to trying this one. Thanks for a great review Robin! Do get the Tuberose ones as well! I admit that in general it is a line that I admire more than wear. I really liked Tuberose 1 and 3 — and definitely liked them more than the rest of the line I think. I hate to say because I haven’t tried them enough times, but I will probably end up agreeing with you. I’m a big tuberose fan, so I’ve had my eye on those well. Thanks for the heads up y’all! Blanc Violette is my favorite of the line : lightly earthy, lightly sweet violets….Moulin Rouge is nice too–lots of plum with mandarin in the topnotes for zip. Beautycafe does a nice sample program, you may want to take a look. I’ll have to dig out my sample. I think this is one (as most of the HdPs) was just something I cast aside as “nice, generic”, but I really don’t remember exactly. Not sure I like the soda pop reference for the top notes, but otherwise it sounds like a nice springy scent. I’ve never read a word by Colette, sorry to say. It isn’t exciting, I’ll grant you that — but I like it much better than you did! Yes, I have the “old” versions of 1826, 1873 and 1804 (I don’t know if that one’s been reformulated or not) and find Collette to be far more dainty and light than what I think of when I think Colette. The citrus is more faint on me while the LOTV tempered with a bit of sweetness is most of what I smell until the sweet and very green drydown. It is lovely and light though the lasting power’s amazing, but I don’t think it fits Colette as she would seem to have liked something headier like you’ve pointed out, Robin. I’m curious to sample the new versions to see how they’ve changed things, though it isn’t a thought that makes me too happy since I think 1876 was lovely just as it was. It really is just all wrong for her. Or there is some sort of link that I just don’t get? I too tested the older version, and while the citrus was pleasant (I’m not a huge fan of citrus, by and large), 1873 veered too sweet on me – a sweetness level comparable to, say, Alien. Not my thing, babes. And my education was sadly lacking in the literature classics, since my dad-imposed College Directive was, “Major in something that’ll pay your bills, young lady!” Maybe I can remedy that soon. I’m sure the local college library would have most of her books, right? Oh my. Trying to decide if it’s that sweet on me, and think not. At any rate, it lacks Alien’s MONSTER sillage, so I can tolerate it much better! Oh yes, would think your library would have any, and do suggest starting with Claudine at School or Gigi or maybe Cheri. oh how I love(d) Colette. I read so many of her books, and cannot find my Claudine collection as I wanted to re-read those this past winter. I did a very quick sniff test on this fragrance, and I didn’t see this as Colette at all. Need to do a full day test – maybe tomorrow. Thanks for the wonderful review (and that photo is gorgeous – I don’t think I have ever seen that one of her before), Robin. Isn’t that a great shot? There are so many cool pictures of Colette. This sounds nice to me — and you’ve got me interested in Colette (I read a little of her many, many years ago but nothing since)! Great review, thanks! Do read more! I might do some more reading myself. Thats a very masculine looking lady. I put my fingers over the poofy hair on the sides of her head and i see a young man whose parents may have been John Lennon and Joaquin Phoenix. She had hair that reached down to her knee, before her husband made her have it cut (so she could look even more like a famous actress of the time and he could parade them around as twins – he was a strange man). I have read (and enjoyed) all her books – except Chéri, which I loathe, but cannot remember any mention of Jicky. I wouldn’t have noticed a mention of Jicky, but also don’t know where that came from — perhaps from a biography? Adding: Colette’s husband, who signed the first Claudine book before they went on to co-sign them (though she was the author), made her dress like the actress Polaire because Polaire played Claudine onstage. It was indeed a strange arrangement. She has a strong face, but I don’t find her masculine looking really. Since she was a talented writer, who cares what she looked like? Anyway, she was considered beautiful, and often dressed en travesti, which added to her beauty. That was true at the time: writers used to slog away in their garrets and their works spoke for them. These days, most people who get published have to be at least photogenic and preferably very attractive so crowds flock to see them on their book tours, etc. 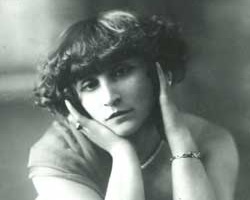 Colette was a performer as well as a writer so she was in the public eye. And, yes, she was considered very beautiful. She didn’t just have beauty, she had charm, which is a much rarer commodity. What I gathered from the ensemble of Colette’s books (Ididn’t read her biographies, nor critical works, so I might be saying something obvious or, even worse, very wrong), is that at some point she started to feel trapped in this travesti role, as she felt she became bound to “perform”… and as she felt trapped in many other ways in some of her relationships and activities. I had the feeling she started to question her own beauty and choices, mixing self-confidence with fragility in a very modern way , with an approach that deeply resonates with me… Hey, what am I saying?this is a perfume blog…And HDP Colette is not my sort of perfume !!! They haven’t done any in the series lately…but that would be cool! I would totally buy a Gertrude Stein fragrance! I would love to try some of that amped up Jasmin et Cigarette! This perfume doesn’t sound all that interesting to me, but the writer very much so. Thank you for a beautifully written review, and I’m going to look for Colette next time at the library. LOL…I would too. JeC was a bit too tame for me. Wonderful review Robin! I have a huge volume of Colette’s works, and read and re-read it for years … I love the dialogue in Le Chat, where Alain tells Saha (his beloved Russian Blue cat) that, after she is gone, “any woman can have me, but never another cat”. I love Colette; she is one of my favorite writers to read in French. (Admittedly one of the few writers I read in French. It is my second language and I much prefer reading in English!) I agree, I think of jasmine in relation to her. I think of Pure Poison!